Seniors, Medicare plan providers, and caregivers can expect a few changes in the 2019 Medicare Part D program. Below are a few highlights from the final 2019 Call Letter and a 1,156 page Medicare Part D (unpublished) Final Rule released on April 02, 2018 by the Centers for Medicare and Medicaid Services (CMS). 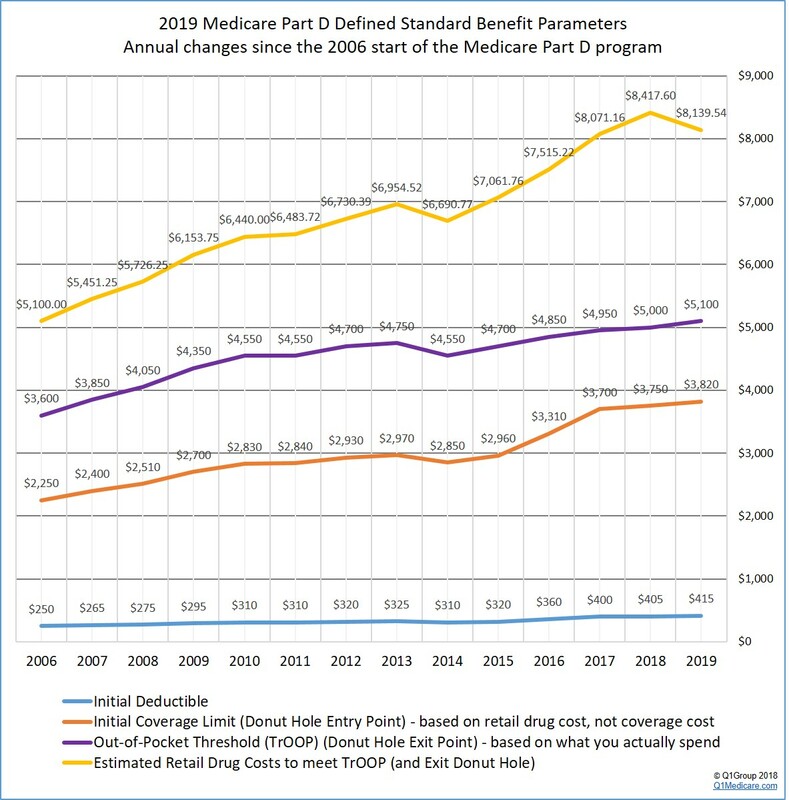 (1) The finalized standard 2019 Medicare Part D plan parameters increase slightly over 2018 Medicare Part D plan coverage (except for the total estimated retail drug spending needed to exit the Donut Hole). CMS published the finalized defined standard Medicare Part D plan parameters that will form the basis of the 2019 Medicare drug plans. You can click here to see our analysis of the 2019 standard defined plan changes and how Medicare Part D coverage has changed over the years. (2) You may exit the 2019 Donut Hole faster than you expected. One key point of the CMS Call Letter is that, based on the Bipartisan Budget Act of 2018 (BBA) enacted February 2018, the brand-name Donut Hole discount will increase to 75% in 2019 - and the pharmaceutical industry will be responsible for 70% of this 75% Donut Hole discount, with your Medicare Part D plan covering the remaining 5%. So if your monthly retail drug costs are over $318, you will reach the 2019 Donut Hole, pay 25% of retail brand-name drug prices, and get 95% of the brand-name retail drug cost credited to your out-of-pocket spending limit (or TrOOP). And this means: You may exit the 2019 Donut Hole faster than you expected and enter Catastrophic Coverage. Based on historical drug purchasing, CMS estimates that if you have monthly retail drug costs over $678, you will exit the 2019 Donut Hole. (3) The 2019 generic drug Donut Hole discount has not changed. As a reminder, the generic Donut Hole discount was not affected or “closed” by the Bipartisan Budget Act of 2018. The 2019 generic Donut Hole discount is 63% of retail – you will pay 37% of the generic drug cost and the amount you spend will count toward exiting the Donut Hole. In 2020, the generic Donut Hole discount will increase to 75%. (4) You will not receive your 2019 ANOC letter and your Medicare Part D plan’s Evidence of Coverage at the same time. (5) Your 2019 Medicare Part D plan will actively fight opioid addiction. (6) Starting in 2019, the Special Enrollment Period (SEP) for Dual-Eligible and Extra Help recipients will be limited to one plan change per quarter during the first 9 months of the year. (7) The Medicare Advantage Open Enrollment Period returns in 2019. In 2019, we will no longer have the Medicare Advantage Disenrollment Period (MADP) that started January 1st and continued through February 14th. Instead, we will return to the Medicare Advantage Open Enrollment Period (OEP) starting on January 1st and continuing through March 31st. The OEP will allow people “enrolled in an MA plan, including newly MA-eligible individuals, to make a one-time election to go to another [Medicare Advantage] plan” - or to leave their Medicare Advantage plan, join a stand-alone Medicare Part D plan, and return to Original Medicare Part A and Part B. "For example, an individual enrolled in an MA-PD plan may use the OEP to switch to: (1) another MA-PD plan; (2) an MA-only plan; or (3) Original Medicare with or without a PDP. The OEP will also allow an individual enrolled in an MA-only plan to switch to-- (1) another MA-only plan; (2) an MA-PD plan; or (3) Original Medicare with or without a PDP. However, this enrollment period does not allow for Part D changes for individuals enrolled in Original Medicare, including those with enrollment in stand-alone PDPs." CMS expects approximately 558,000 Medicare beneficiaries will use the OEP to make an enrollment change. You can read more about the 2019 Medicare Part D plan year outlook at: https://Q1Medicare.com/2019. You can also sign-up for our Medicare Part D Reminder Service: 2019 and we will send an email as information becomes available on the 2019 Medicare Part D program and plans. Your email will not be shared with anyone and you can unsubscribe at any time.